Content marketers: It’s time for you to lean in, step up, and learn how to function as a strategic partner in your business. 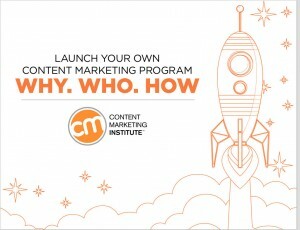 Download our new workbook, Launch Your Own Content Marketing Program to help you get started. Using a series of easy-to-complete practical exercises, the book shows you how to reflect your brand’s values and benefits in the content you create, and to leverage content as the foundation of a distinctive, engaging, and scalable marketing program. Sign up now to download Launch Your Own Content Marketing Program and receive a free subscription to CMI’s daily articles and news. You can unsubscribe at any time.